The more pürminerals products that I try, the more that I am taken by the line. They make such lovely high quality products, and they are inherently affordable when compared to their luxury department store counterparts. Lip and cheek products always serve as my litmus tests for a line, and I'm pleased to say that pürminerals has exceeded my expectations in both categories. Their Chateau Cheeks blushes come in both cream and powder formulas, and I'm pleased to report that both boast phenomenal quality. Chateau Cheeks Pressed Powder Blush in Savvy (on the left): Savvy is an astonishingly beautiful muted berry that is ultra finely milled. So much so, in fact, that one might liken it to the much sought after cream to powder type of formula. It spreads across the skin effortlessly while depositing gorgeous pigmentation in a single sweep across the cheeks. The refined sparkle translates to the perfect sheen that lends itself to the natural glow from within appearance that I always seek in my blush. Savvy can easily be sheered out for a natural flush or built-up for maximum drama. 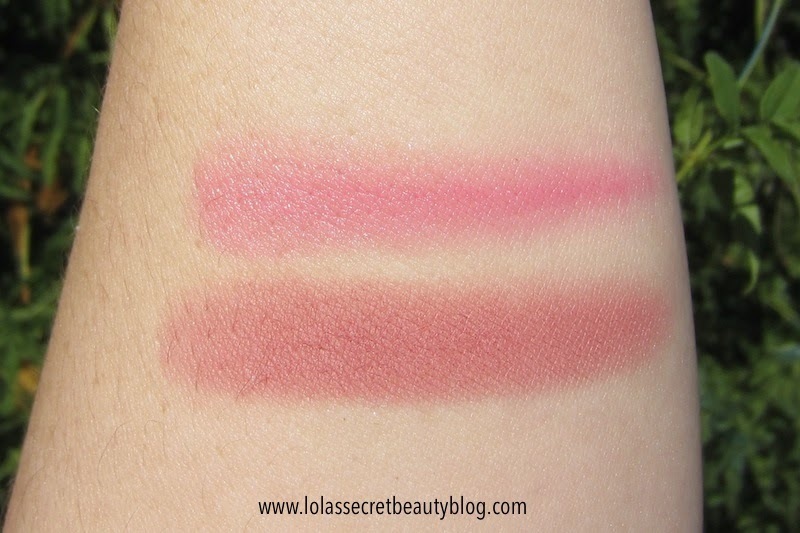 I'm a bit of a blush enthusiast (understatement), and I can find no fault with this formula. It's ultra smooth and long-wearing, and the color is gorgeous! What takes this formula to the next level is that it includes antioxidant rich anti-aging skincare ingredients. Get a gorgeous, age-defying glow with this pressed mineral blush with built-in Farm to Jar™ skincare! As you highlight and accentuate your natural features, your skin will drink in the anti-aging benefits of vine-fresh Resveratrox® and Vitisin, harvested exclusively for Pür from Bordeaux's famed wine region. Taken from the vines, shoots and skin of wine-producing grapes, these key ingredients have been shown to soften the look of lines and brighten the skin's appearance. Paraben-free. Gluten-free. Ingredients: Mica, Boron Nitride, Zinc Stearate, Octyldodecyl Stearoyl Stearate, Octyldodecyl Stearate, Silica, Propanediol, Argania Spinosa Kernel (Argan) Oil, Calophyllum Inophyllum (Tamanu) Seed Oil, Glycine Soja (Soybean) Seed Extract, Aqua, Phenoxyethanol, Caprylyl Glycol, Vitis Vinifera (Grape) Vine Extract, Vitis Vinifera (Grape) Root Extract, Ceramide 2, Sorbic Acid. May Contain: Mica, Titanium Dioxide (CI 77891), Iron Oxides (CI 77491, CI 77492, CI 77499), Red 6 (CI 15850), Red 7 (CI 15850), Red 27 (CI 45410), Yellow 5 (CI 19140), Yellow 6 (CI 15985), Bismuth Oxychloride (CI 77163), Manganese Violet (CI 77742), Ultramarines (CI 77007), Tin Oxide, Carmine (CI 75470). Contains carmine as a color additive. $18.00 for .14 oz. Available from pürminerals. Chateau Cheeks Cream Blush in Flirt (on the right): Flirt is my favorite kind of pink blush! It's a stunning bright and clear blue-based pink that makes my heart sing. 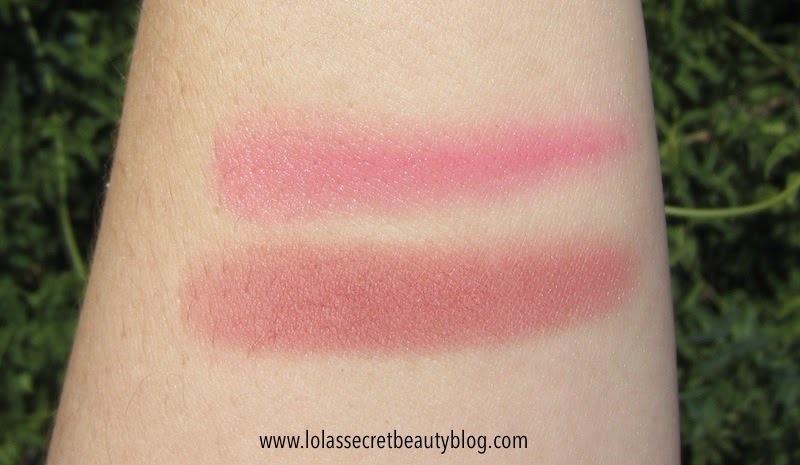 It's one of those perfect pinks that those among us with cool-tones skin always seek out! The texture is creamy dreamy and glides across the cheeks evenly and easily, and with no skips. Unlike some cream formula blushes that emphasize pores-- this one does not. Instead it offers the perfect natural finish and stays put without fading for many many hours. It can be sheered out or built up for more drama, but I find the natural flush to be perfection. This lovely formula is also filled with antioxidant rich anti-aging skincare ingredients, and now has the distinction of being one of my favorite cream blushes! Highlight and accent your cheeks with velvety colour cream blush featuring built-in Farm to Jar™ skincare. As you add natural depth and warmth to your complexion, your skin will drink in the anti-aging benefits of vine-fresh Resveratrox® and Vitisin, harvested exclusively for Pür from Bordeaux's famed wine region. Taken from the finest wine-producing French grapes, these key ingredients have been shown to soften the look of lines and brighten the skin's appearance. Château Cheeks Cream Blush contains NO mineral oil, petrolatum or lanolin oil and is non-comedogenic. Paraben-free. Gluten-free. $18.00 for 0.08 oz. Available from pürminerals. Overall Assessment: It's true love for me! I can't often make this claim, but I see myself hitting the pan on both of these!